"Maria Luigia Borsi...is a young, sweet-toned lyric soprano able to float pianissimos in the highest register to ravishing effect." proves well suited for Respighi's Il tramonto." 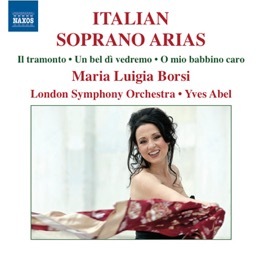 "The soprano voice of Maria Luigia Borsi is very recognizable, as it happens rarely in this globalized world of singers, and at the same time, she is able to bestow upon each of her characters…so much original, distinctive profile, as it happens only in rare occasions." "In the comprehensive half dozen Puccini arias Borsi reveals faultless artistry. One can hardly say it better. This is as near to as good as it gets. Catalani’s 'Ebben? Ne andrò lontana' (from La Wally) is liberally represented in the legendary discographies of Callas, Gheorghiu, Tebaldi and Fleming. Borsi delivers the excerpt with ravishing beauty and certainly merits a place among their olympian ranks." "It is a voice of considerable beauty that was obviously born to sing the sad roles Puccini gave to his leading sopranos."